Who does not dream of an endless beach vacation? 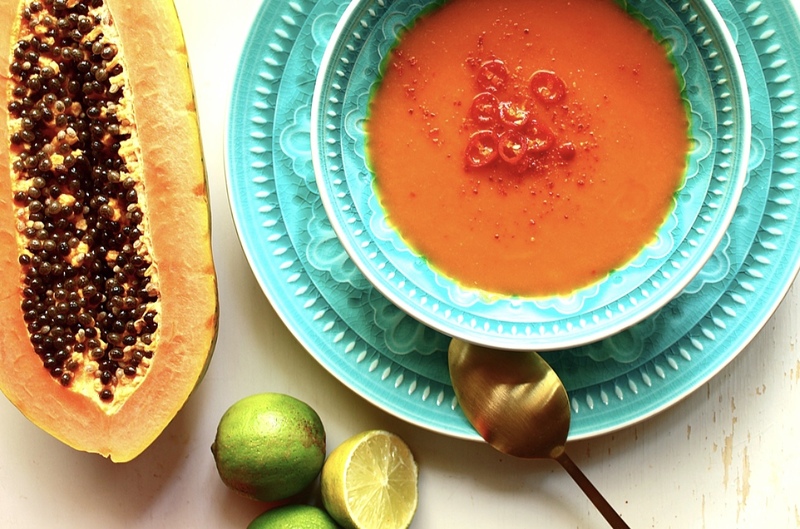 This exotic papaya soup with lime, chili & coconut brings the flavours of remote islands! Boost your vitamin C levels with papaya & chili, a two-pack of fat burners that get you beach ready – in case you head to the exotic destination of your dreams! Start by cutting the papayas in halves; remove the seeds, peel the skin and cube the papaya. Finely chop the onion, garlic & chilis and grate the fresh ginger. Sauté the onion, garlic, ginger and chili with some curcuma in coconut oil – add the vegetable broth & the chopped papaya. Let cook it for about 10 minutes on medium heat, then puree to a soup. Finally, add the coconut milk, lime juice, and season with salt & pepper. Posted in Food and tagged papaya, soup. Bookmark the permalink.